A Sanskrit Dictionary of Amarasingh's amalinganusasanam in three Chapters Critically Edited with Introduction and English Equivalents for each word and English Word-Index. The study of any Language consists in mastering its vocabulary and Grammar and then its Literature. To master the vocabulary simply becomes a hard task, if some means for remembering the words of that Language are not devised, either by studying the best Literature of that Language or versification of words with their meaning. In no Language except Sanskrit, this feat of versification has been successfully accomplished. Consequently an old Pandit having mastered the versified vocabulary of Sanskrit easily understands or scans any difficult verse given to him without the aid of Dictionary. The printing of original Sanskrit words has been made in bold type. While their meaning and their grammatical notes, as given by Amarasinha, have been printed in ordinary types. English equivalents have been given in the margin with their number for each word. The verses considered as by have been separately shown and numbered. These arrangements would help both the teachers and the taught to study the Sanskrit vocabulary very conveniently. 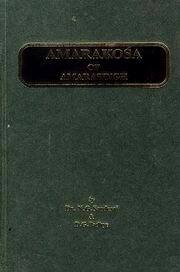 If this book of Amarakosa be studied in the High Schools from Standards IV to VII by convenient divisions for each standard, it would be a boon to the students, so much so that they would be able to read any Sanskrit book easily like an English novel. We conclude, therefore, with a sincere request to the Educational authorities to get this book prescribed in High Schools with convenient divisions of it from St. IV to VII and thus revive the study of the dying Sanskrit Language.